A home was badly damaged after embers from a neighbours bonfire spread to a garden and house extension. Crews from Wisbech, March and Long Sutton were called to a shed fire in Gorefield Road, Leverington at 1.31pm yesterday, Sunday August 7. When crews arrived, they found fencing and a shed measuring 5m by 10m alight, which was affecting a single storey lean-to extension. Firefighters wearing breathing apparatus used hose reels and jets to extinguish the fire. Station Commander Stuart Smith said: “Although unfortunately the lean-to and garden were destroyed, crews worked hard to stop the fire from spreading to the extension on the property. 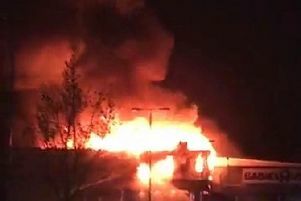 “We believe this fire was caused by embers from a bonfire in a neighbouring garden, being carried by the wind and spreading.